Throwing a bridal shower for someone you love? Select a few games or activities to help guests break the ice, pass the time during the gift-opening portion, and have an all-around blast. Here, 25 editors' picks that'll suit any bash. 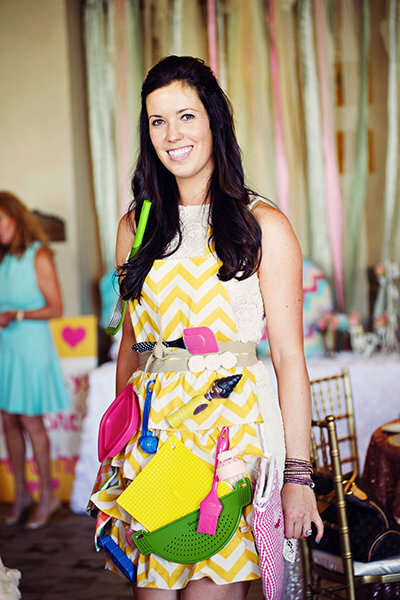 Pin kitchen tools to an apron that the bride-to-be must wear for one quick walk around the room. Afterward, have the guest of honor take the apron off, and ask partygoers to jot down all of the items that were on it. You may already be familiar with the classic shower game where guests receive one clothespin each, and they're instructed not to say the word "bride". If someone hears them break this rule, then they need to forfeit their pin. (Whoever has the most clothespins at the end of the party is the winner). For a fun twist, distribute candy ring pops instead! The toilet paper game never fails to make guests crack up. How it works: Divide everyone up into a few different teams, and ask a "model" from each group to come forward. The rest of the team members have to create a wedding gown to dress her up in using rolls of paper towel (no scissors or tape allowed). The bride awards her pick for best-dressed! The number-one question on guests' minds when it comes to the wedding is, "What will the bride be wearing?" Challenge them to design what they envision for the bride's gown! Distribute art supplies and these outline "guides" by Etsy seller Blushed Design. Award a prize to the artist whose rendering is closest to the actual dress. For a fun way to get the party started, you can't beat scratch-off cards. Etsy seller Janet Morrin offers a set of 24 cards with two winners in each batch. Come up with a grab bag for the scratch winners to reach in and claim their prizes. If traditional shower games aren't really your speed, consider treating guests to a learning experience they'll never forget. For example, guests at this shower took a professional makeup class, where they learned how to create the perfect smoky eye. Lots of laughter will ensue after you play the "Who Has The Groom?" game. Print these celebrity cutouts from Etsy seller Works Of Heart Shoppe on cardstock, as well as one of the groom. Tape them under guests' chairs at the shower before they arrive. Whoever finds the groom under their chair is the lucky winner! "Find The Guest" is an easy way to encourage guests to mingle. Etsy seller Pretty Collected offers cards with fun prompts that require partygoers to conversate with their neighbors to discover fun facts about them. For example, find someone who was born the same month as you, and another who drives the same car as you. The winner is the guest who has the most answers. Build a custom Jeopardy board with categories that relate to the bride and groom's interests. Award a prize to the top winner — Alex Trebek impression optional. Have the bride and groom face-off in a trivia challenge! Or, if the shower is girls-only, record his responses or questions ahead of time on video, and then play it for all of the guests. Create a top ten list of quotes, and have attendees guess whether the bride or groom said each one. Bonus points if you include silhouette illustrations for them to circle. Display a collage board with photos of the bride throughout the years, and have guests guess how old she was in each of the snapshots. If the bride loves all things crafty, plan a DIY activity for guests to enjoy. At "Bachelorette" Desiree Hartsock's bridal shower, guests designed their own flower crowns and mixed signature scents at the perfume bar. Every guest has their own signature dish — have them pass on their favorite recipes to the newlyweds-to-be. Create preprinted cards with different sections laid out (e.g. ingredients, directions, special tips) so that they're easier to read. Brides are getting ultra-creative with their wedding guest book, and the bridal shower is no exception. One popular choice: Ask loved ones to sign a decorative plate that the bride can use in her new home. At this shower, guests were asked to jot down their favorite memory with the bride — how sweet is that? Create DIY drink coasters where guests can fill out their marriage advice for the bride and groom. Sushi or pizza? Carnival or baseball game? Karaoke or matinee show? Help out the happy newlyweds by crowd-sourcing date suggestions, which will certainly come in handy after their big day. For a 21st century-twist on traditional Pictionary, guests must correctly decipher the wedding words and phrases using emojis! Etsy seller Clink Paper offers a print-ready digital download that's set up to print two games per standard sheet (it also includes an answer key). The "bow" hat is a time-honored bridal shower tradition, to the chagrin of bashful brides everywhere. It's a great activity to keep little ones occupied or include someone who isn't in the bridal party. Play "What's in Your Purse?" to see who carries the most random things in their bag! Create or purchase game cards, awarding points to different categories. Whoever has the most points wins.